With its sleek design, blood red paintwork and bespoke features, the Fahrradi Farfall FFX looks like a next generation Ferrari supercar. But this Ferrari relies on pedal rather than the more conventional horse power. Based on the Italian sports car manufacturer’s B50 million track-only Ferrari FXX, it took Austrian artist Hannes Langeder a year to create this unusual bicycle. 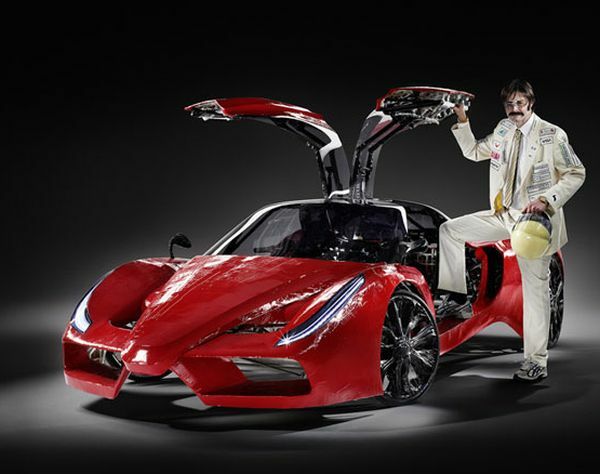 The designer shot to fame in 2010 after a lightweight Porsche he created was driven by motor expert Richard Hammond on Top Gear. The vehicle’s name was inspired from the Italian for butterfly after it was described by one expert as moving “silently and with the weightless elegance of a butterfly”. Made from a combination of plastic and light-weight steel, the unique bicycle weighs just 100kg and is steered using pedals which control 11 different gears. Langeder even claims the vehicle actually lifts off the ground when ridden by a fast enough cyclist. The eco-friendly car is currently on display at an automotive exhibition in Austria where it is considered road-safe.